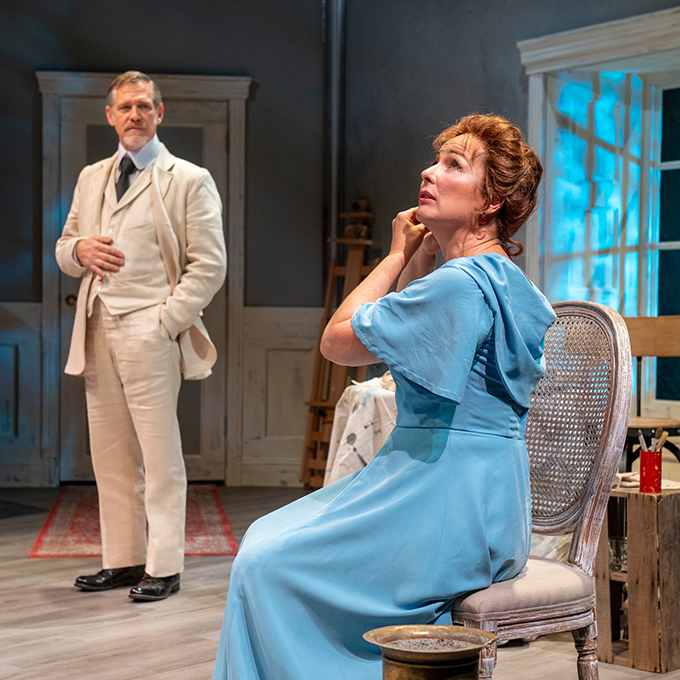 Director Barbara Damashek reincarnates August Strindberg’s exploration of vengeance and hatred into a gripping modern story of male toxicity. Her “Creditors” shows how one man can implant the seeds of doubt in another—and destroy love. These three characters could be suffering souls on the Jerry Springer show. 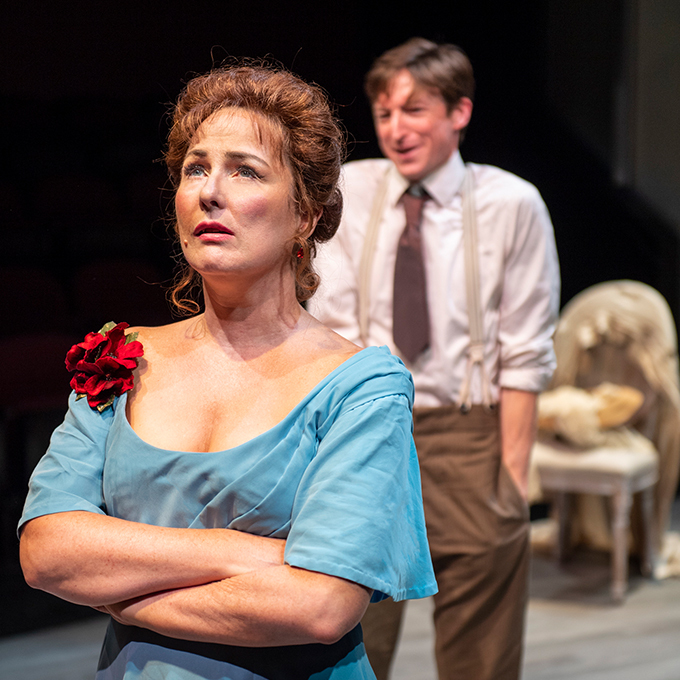 “Creditors” spins a delicious tale of betrayal, asking how much we are “in debt” to a wife or husband. 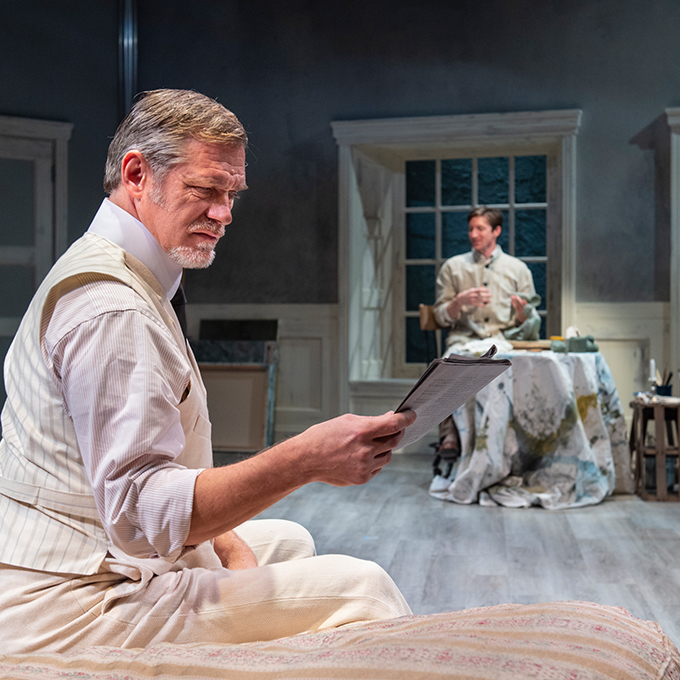 Lighting Designer Jim Cave and Scenic Designer Angrette McCloskey have created an beautiful arctic white, Big Brother hotel room on an island where the emotional surgery unfolds. Each scene is gripping and beautiful. 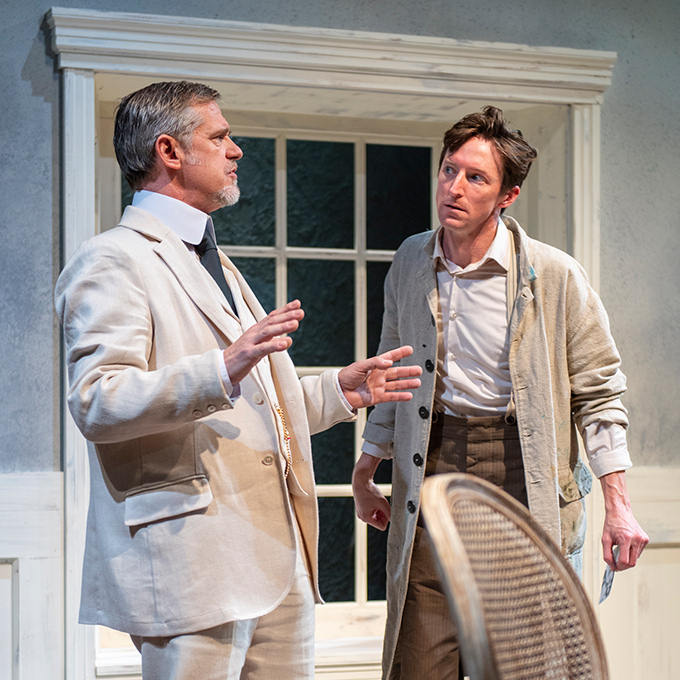 Naïve young sculptor Adolph (hypnotic Joseph Patrick O’Malley) and sharply dressed, older Gustav (dominating Jonathan Rhys Williams) are discussing art and love. Gustav circles Adolph, weaving arguments, while the young man works on a miniature figurine of a curvaceous woman. For them, woman remains an object. O’Malley gives a splendid performance as the unhealthy, hobbling Adolph, smiling his way through Gustav’s cutting attacks. He is a doomed creature being painfully analyzed and eviscerated. Rhys Williams intrigues us, as he cunningly weaves a chilling web of lies and innuendoes. Initially, both men seem to be engaging in nothing more than locker room talk—until Gustav brings up Adolph’s wife, Tekla. 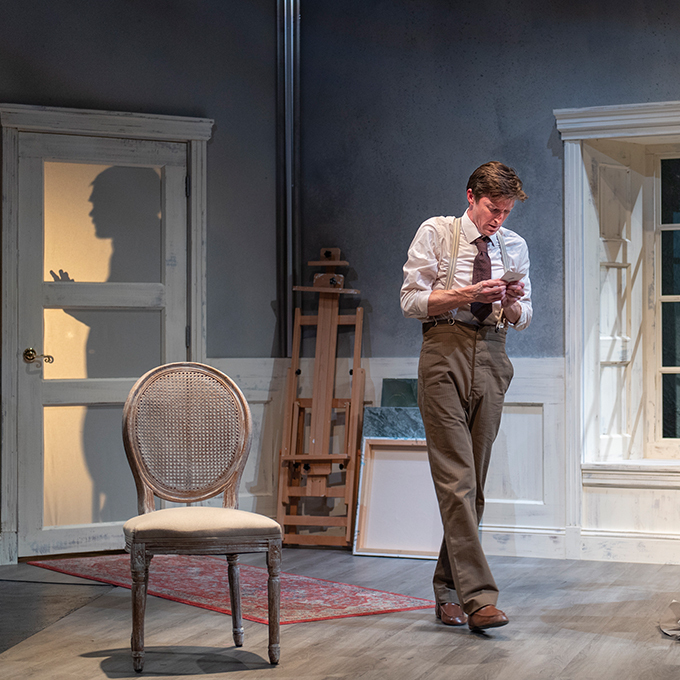 The dynamic shifts, as Gustav cleverly manipulates his “friend.” We squirm in our seats as the older man systematically destroys Adolph’s confidence. Gustav’s remarks are so subtle and insidious that we catch our breath when he gets more and more obscene. He knows too much, yet he is a mystery. 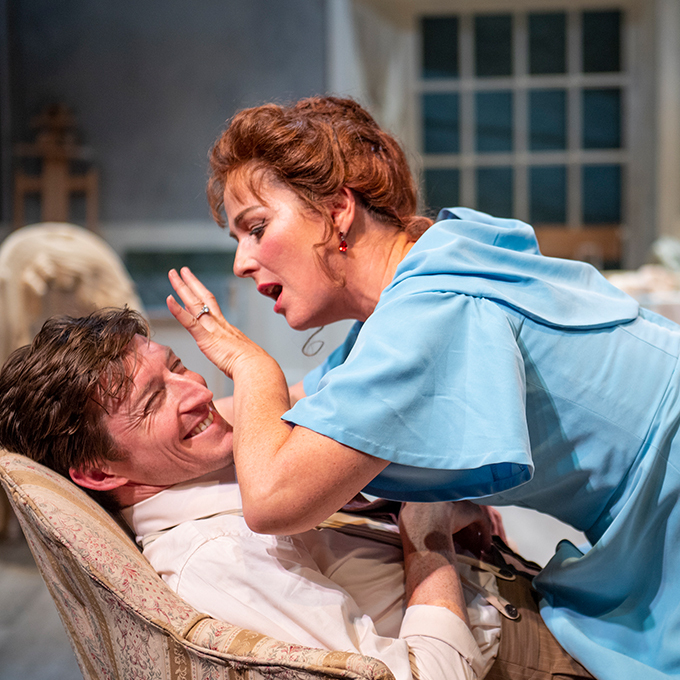 Adolph confesses that he no longer has male friends “to knock about with.” Gustav insinuates that Tekla owes her first novel to her young husband, appealing to Adolph’s ego. Without him Tekla would be a nobody. And Adolph begins to view his beloved wife more as a succubus than a loving partner. Gustav suggests a test. He hides out when bubbly Tekla (delightful, inventive Rebecca Dines) bursts in, wearing a bold outfit, a pale blue dress paired with candy apple red heels. Dines enchants us with her expressions, her eyes, her glances. Her Tekla, vibrant and lively, loves to be seen. But she notices a change in Adolph. Tekla and Adolph play cringeworthy sexual games, as “Big Sister and Li’l Brother.” She defies standard women’s roles—but at what cost? Gustav the ultimate troll, has laid a foundation of distrust, worthy of the Jerry Springer Show. What terrible debt is Gustav here to collect? Who is he? When Gustav casually bumps into Tekla, she acts like a skittish girl. Alone with Gustav, Teklas’ change of behavior throws us into doubt and dismay. Those who believe that “hell hath no fury like a woman scorned” have never met Gustav. In a fascinating battle of egos, full of dramatic twists and turns, we are constantly surprised. Once Damashek and Strindberg have us hooked, we become part of the unruly game. In three powerful and hypnotic scenes, a psychodrama plays out—their deep-seated hatred and love enthrall us, step by step. Don’t miss Aurora Theatre’s diabolical masterpiece! Cast: Joseph Patrick O’Malley, Jonathan Rhys Williams, and Rebecca Dines.